"Oh my gosh, those two are an incredible tandem." The 2018 offense has averaged 4.23 runs per game, which is worse than the 4.26 mark of last season's 96-loss campaign. The .237 team batting average is the second-worst in all of baseball. They rank 10th in the NL in OBP, 11th in slugging, and 11th in OPS. Their 24.6 strikeout percentage is the third worst in baseball. They have 202 more strikeouts than hits, the second worst rate in the majors. They have the sixth fewest stolen bases in baseball. The Phillies offense produced those numbers with a roster that includes Carlos Santana, Odubel Herrera, Cesar Hernandez, plus a full season of Rhys Hoskins. I'm rarely one to point a finger at hitting coaches considering how little we know about what is actually going on behind the scenes. However, that is the nature of the job, and hitting coaches are judged by the outside world on team stats and the progression or regression of the players. The list of players with serious regressions or performances well below their expectations this season is long: Odubel Herrera, Cesar Hernandez, J.P. Crawford, Scott Kingery, and Aaron Altherr. 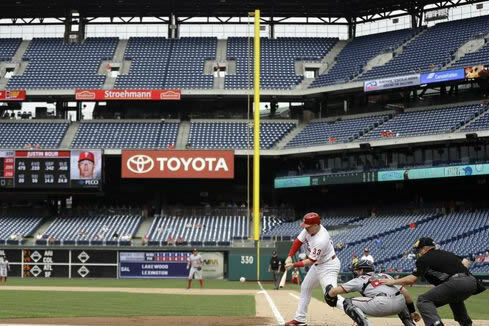 There is one hitter on the entire Phillies roster - Maikel Franco - who has made a clear step forward. But don't forget that Franco was benched earlier in the season, and if it weren't for an injury to J.P. Crawford, he might have never found his groove. That may not be enough on its own to warrant firing someone, but how can a manager give such a ringing endorsement of his hitting coaches with a straight face? But to focus on the coaches is to ignore the bigger problem plaguing this organization. It's quite possible their entire philosophy is flawed. Kapler loves to speak of the "Phillies style offense." The premise is for batters to work deep counts to create walks, wear down pitchers, and force mistakes that they can pounce on. The first part of that equation has worked. The Phillies have seen the second most pitches per plate appearance (4.02) in baseball and they have the third best walk percentage (9.4%) in the National League. This is where it’s sort of worrisome, that the team isn’t great at swinging at strikes compared to reaching at balls. They swing less than other teams, but when they swing, they show below-average ability to discern the right balls to swing at. That’s what you see when you see they’re ranked 12th in the National League in swinging at strikes (Z-Swing) minus swinging at balls (O-Swing). Now, let's talk about launch angle. Two of the biggest disappointments this season have been Cesar Hernandez and Odubel Herrera, two players with huge increases in launch angle. Hernandez’s average launch angle has nearly tripled (from 3.3 degrees to 9.2 degrees) since last season and Herrera’s has jumped over 40 percent from (8.9 to 12.5). Hardly seems like a coincidence. For Kapler to hoist such praise upon his hitting coaches knowing how bad it will sound suggests that he is not alone in that line of thinking. To add more credence is the fact that Joe Jordan stepped down and the Phillies fired four hitting coaches in the minor leagues this week. Perhaps I have this all wrong, though. Maybe it's not the philosophy, but the lack of talent. That's an equally frightening thought considering most of these players have entered the Phillies system under the current regime, been groomed in the Klentak/MacPhail school, or both. 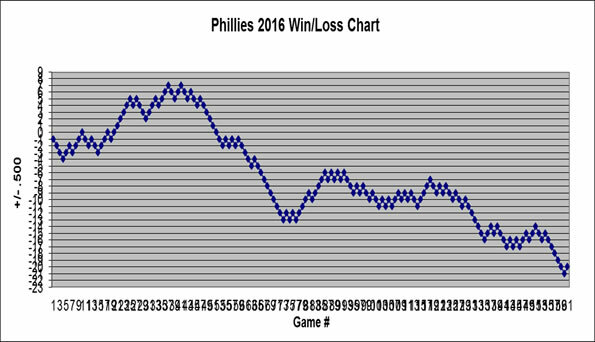 This Phillies team is far more flawed than most of us admitted. Using the word incredible to describe the two men in charge of one of the worst offenses in the league suggests that the flaws may run further up than we thought.